After JJ left for school and we had eaten breakfast and cleared a bit of sleepiness from our heads, EJ and I drove to our friend RB’s place in the country to get a load of the firewood that he said we could have. He had stacked the wood high in an old trailer made from a pickup truck. It was stacked too high for us to hitch the trailer to our truck, and it didn’t have a hitch ball (or whatever it is called) so we just loaded some of the wood into our truck. As soon as we can, we will come back and pull the trailer with the rest of the wood to our house to unload. The trailer was nestled in the weeds next to an apple tree. We each picked an apple from the tree. EJ ate his right away, but I decided to save mine until later. I put it in on the seat in the truck. We drove home and then unloaded the wood into the woodshed. We had bricks stacked in front of the RV, but now that it is sold and gone, we moved the bricks to another out-of-the way place. I got a lot of the bricks moved yesterday. Usually I carry four or five bricks at a time, but these bricks had a lot of spiders and bugs on them, so first I threw them on the grass and then I tapped them to dislodge creepy crawlies. i carried only two bricks at a time because I didn’t want to have an armload of bricks and have bugs crawl all over me. Today EJ helped me move the rest, but he went and got the wheelbarrow and loaded them in. It went a lot faster that way. While i went in to fix lunch, EJ measured the opening in the fence where the RV had been parked. Thursday we hope to take a load of steel (from an old microwave, old lawn mower, and old water heater) to the steel place. They pay for steel. Then we will go to a home improvement store to buy a piece of fencing and other stuff we need for projects. We are developing a list of all the tasks we want/need to complete. The list is getting long, but the tasks are fun when we do them together. A couple of days ago my computer broke. The fan had been making funny noises for quite some time, so i think it needs to be replaced. It also needs to be cleaned. AND it suddenly stopped charging for some reason. A broken computer is a very, very horrid thing, but I might survive because my dear husband is letting me share his computer. He uses it when he is home, and I use it when he is at work. His computer keyboard is a little different from mine and none of my bookmarks or pictures are on it so I miss my computer, but I am grateful I have a computer to use. We have a friend who is knowledgeable of computers and he is going to try to fix mine. I really, really hope he can fix it. My computer is my precious. We took my computer to our friend today after lunch. He was at work (he works at the same company as EJ but a different shift) and left it with his wife. We invited Danny to go with us. 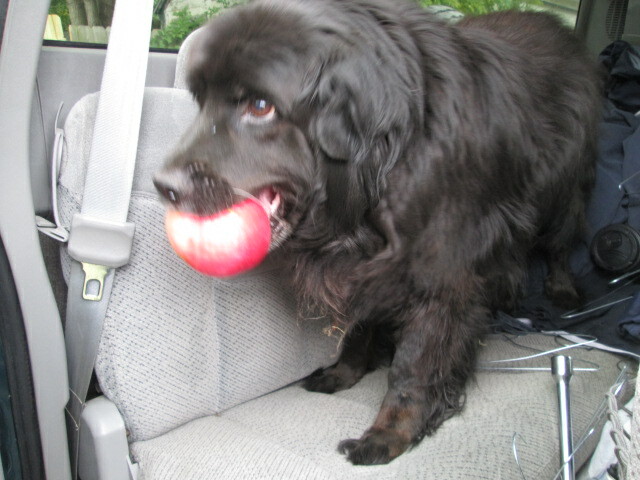 He eagerly jumped into the truck…and immediately stole the apple that was still lying on the seat. I had my camera with me so I took a picture of him. I decided that I would not eat the apple after all. After EJ left for work, i took Danny, the Apple Thief, for our walk. The day was very beautiful. It was cloudy today, although it didn’t rain. Some of the trees are colorful, although many of them are still mostly green. We have not yet reached the peak of color. I love the colors of fall–the beautiful trees, the colors of the fields, and the deep blue sky or very dramatic dark clouds. On our route, Danny and I always walk past a new community park the village is developing. I walked down a trail in the park just a bit so i could take a picture of the scenery. 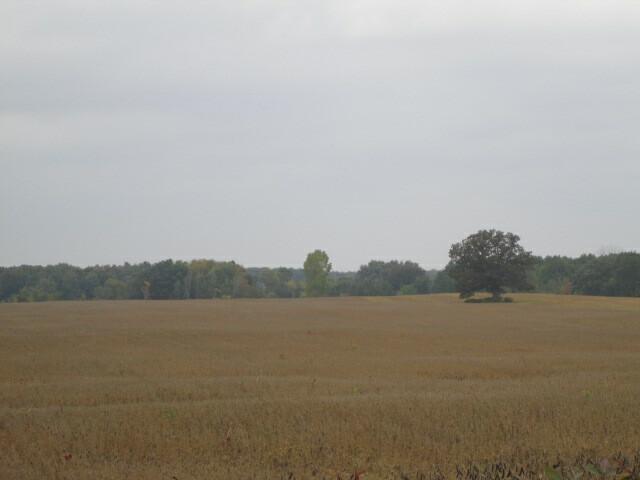 Our village is very small–about four blocks wide and long–and the park is on the edge of fields. After our walk, i dug up some mint, oregano, thyme, and fennel plants and put them in pots and added them to my collection of indoor plants. I hope that I can keep them alive over the winter. I dry herbs from my garden, but i think it would be nice to be able to have fresh herbs too. I have clusters of plants at all my livingroom and kitchen windows.